change to 1.5͒C? Do you think we can realistically achieve that? Politically, what needs to happen? that by joining together we can create a better world. short-sightedness and commit to urgent climate action. start working together more urgently. resilience should be recognized and applauded. alive on a daily basis. 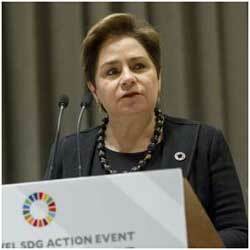 multilateralism to tackle climate change? action such as the United Nations and forums such as the G20. making us more interdependent than ever before. working and which need to be reviewed. recognize concrete measures by the full range of actors. in taking concrete actions to reduce emissions. that demonstrate the enormous potential of climate action. 2050. These targets are often developed in collaboration. powerful force for climate action. emissions, created the Transport Decarbonisation Alliance. also help to reduce urban pollution and improve public health. management of road, air and other transport networks. ambition and to share success stories and best practices. enshrined under the Paris Climate Change Agreement. campaign to encourage every day climate action.